Why Does it Work and How Much Should You Drink to Maximize Fat Burning? Take a moment to think about the last time you had more than a glass or two of water in a given day. Not all that often, right? Well, it turns out that one of your most powerful weapons for fighting fat might be right there in your tap. You've heard the old 8 x 8 rule - drink eight, 8 ounce glasses of water per day for 'optimal' health. Is there any evidence to support drinking 64 ounces of water per day for health or fat loss? As early as 2004, WebMD health news was reporting on the benefits for people who choose to drink water to lose weight. Specifically, they reported on a study published in the The Journal of Clinical Endocrinology and Metabolism. This study by Dr. Michael Boschmann and team from the Franz-Volhard Clinical Research Center in Berlin, Germany. Dr. Boschmann and team studied 7 healthy men and 7 healthy women. They discovered that the subjects metabolic rates (the rate at which your body burns calories) were elevated by 30% for both men and women after drinking 17 ounces of water. The effect began about 10 minutes after finishing the water and peaked after about 35 minutes. Boschmann and team figure that increasing the amount of water you drink 1.5 liters (that's about 50 ounces) you'd burn an extra 17,400 calories per year. That's just shy of five pounds of fat gone each year. Just from drinking water. Leslie Bonci, a nutritionist and former spokesperson for the American Dietetic Association was more pessimistic about the study. When asked about the study by WebMD, she responded, "Obviously people are looking for ways to increase metabolism, but this is an very, very, small effect. We are talking about just a few calories a day." I would counter that saying it's "just a few calories per day" is a bad reason for not doing something. A few calories per day adds up to a lot of calories per year. In an age where the food, diet and fitness industry is making it harder to eat healthy, you should take every advantage you can get. In fact, according to this study, it adds up to about 5 pounds worth of advantage. For doing nothing more than drinking water. In both 2009 and 2010, CNN.com published online articles indicating that you should drink water to lose weight. In the 2009 piece, Diet and Fitness Expert Dr. Melina Jampolis answered a reader question about the benefits of drinking water to shed unwanted pounds. Dr. Jampolis cited a study by Dr. Brenda Davy of Virgina Tech. In that study (published in the Journal of the American Dietic Association), Dr. Davy discovered that people who drank water before meals consumed and average of 75 fewer calories that particular meal than they would have otherwise. Again, this seems like a small amount. However, if you put this trick into practice for just lunch and dinner (or supper, as we Southerners like to call it), you're talking 150 calories per day. Multiply by 365, carry the 1... divide by 3500 calories per pound of fat… and you're talking potentially 15.5 pound of fat loss per year! In that answer, Dr. Jampolis cites another study by Brenda Davy. This study, presented in October 2008 at The Obesity Society annual meeting in Phoenix, Arizona, was so important, CNN.com, Discovery News, and Health.com all dedicated an entire articles to it. In 2010, Denise Mann of Health.com summarized Dr. Davy's work for an article published at CNN. Emily Sohn also discussed both of Brenda Davy's studies on drinking water to lose weight for Discovery News. 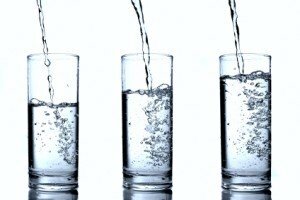 If you want to drink water to lose weight, according to Dr. Davy's study (presented again in 2010 at the American Chemical Society in Boston), you should shoot for 16 ounces of the clear stuff before breakfast, lunch and dinner. In this study, Dr. Davy looked at 48 men and women between the ages of 55 and 75 who were classified as overweight or obese. All of the particapants were on a calorie controlled diet - 1200 calories for women, 1500 for men. From there, half of the study's participants were told to drink 16 ounces of water before each of their meals. After just 3 months, the water drinkers lost 41% more weight than the non-water drinkers - 15.5 pounds versus 11 pounds. Assuming that difference continued for an entire year, you're looking at 18 additional pounds of weight loss versus just "dieting." What's interesting about this particular study is that it measures the effects of both the metabolic increase as well as the reduced calorie consumption. Recall earlier, we estimated that the metabolic rate and calorie reduction would lead to about a 20.5 pound loss per year... that's pretty close to the 18 per year we'd derive from this study. That's as close to "Myth Confirmed" as you can get, my friends! For years, the conventional wisdom was that drinking water before meals "filled you up." Brenda Davy's two ground breaking studies were some of the first to actually prove that you can drink water to lose weight. Who Else Drinks Water to Lose Weight? According to Self Magazine, a plethora of stars drink water to lose weight. At the top of the list is Brooke Burke (she drinks Omega 3-infused water from Omega Water). And stars such as Victoria Beckham, Gisele Bundchen, Courtney Cox, Kim Kardashian and Rhianna have been spotted carrying around coconut water. And celebrity trainer Jackie Warner recommends drinking up to 3 liters (about 100 ounces) per day to burn calories (and fat). From the science community to the entertainment community. Analytic to anecdotal. The evidence is clear. Drink water to shed fat. Drink water to boost metabolism. Drink water to lose weight. If you're trying to melt fat but just can't seem to find the time, you're in luck. Metabolic Mayhem has revolutionized the efficiency and effectiveness of what a fitness program can do and be. With the emergence of Hormone Harmonics and Carb Correlating to sync with these innovative metabolic workouts, you'll see that Metabolic Mayhem is much more than a fitness program. It's a framework that's been designed to maximize fat loss in minimal time.